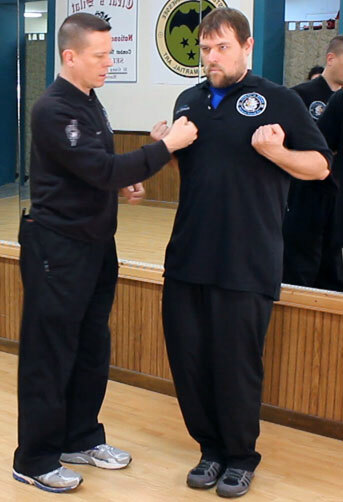 We’re going to begin this series on Wing Chun with the basic body mechanics and stance. Pull the shoulders down and back. Push the chest forward. …and when I say stance, it’s only stance when you’re stationary in the beginning. Eventually you want it to be moble and still have all the Iron Body and Internal Power benefits of this posture. I’m going to try to give you some insight into that. There’s some simple things that are more external and then there are some more difficult things that are internal and I’m going to try to make that simple for you. What I want you to do first is stand with your feet together arms your sides. Make fists, bring them up as high as you can and pull them back so they are in line with your chest. Pull the shoulders down as much as you can. You’ll feel the pushing out expanding stretch of the chest. from there push the chest out even more. Make sure to puff the chest out and expand it as much as you can. Expand your chest and upper body as much as you can. Now lift the whole body up and out so you feel the solar plexus streatch and creat a vertical stretch through the front of the whole body. This will begin to protect the solar plexus and stomach area. The chest and stomach should feel like it’s being pulled tight like a drum so that any impact, instead of going in, is being spread out across it. There are a number of internal things being done but obviously there is some external stuff going on as well and even the internal part of this training is much more strenuous than most people would expect. This training is a good introduction to this type of internal and it’s putting you in the right kinds of body alignments and it’s making the breath come all the way in deep into the belly. So instead of the breath coming only into the upper chest (which poor posture encourages) this posture forces the breath to be deep and fill the belly as long as the posture is done correctly. Breath in and out the entire time. Don’t breath 100% in or 100% out. Breath should be deep and full but you should always have a reserve so that you can breath in or out a little more at any point if need be. Now do everything we’ve covered up to this point. …and and here’s the tricky part and it is part of what’s internal about this. The trick is I bend my knees while I still stretching inside. So when I bring my knees forward I feel that stretch through the whole leg and my toes are gripping the floor. Then push up all the way through you while keeping the knees bent so that you are stretching and expanding through the whole body. You can also turn the heals out first then the toes then the heels again. Then sink the knees pushing them forward and out so they could touch if they absolutely needed to. This will create a spiraling twist through the legs you should feel pressure on the outside edges of your feet as your toes are trying to turn outwards. The spiral twists up trough the legs (keep your knees bent) up through the body and out the arms. Spend 2 – 5 minutes in this posture initially. Now push your pelvis out and up to enhance the stretch through your entire body. Hold this posture and breath. Make sure the stretch is there and maintain it as best you can. If you break that connection, that internal connection which is what feels like that spiral and that stretch through you, then that’s where a hole in your ‘armor’ will be for this posture. That area will not be developed properly and the entire posture will not be as effective in building Iron or Power. You want your body to take on the qualities of this so that it’s there even if you aren’t in this stance and that you can turn this quality on at will. This is just one exercise. We have a complete set of these that focus on different areas to build Iron and Internal power from head to toe. This training will increase power in several ways. One of them is Spring Power using the coiling action all the way through your body. This will add a lot of power to your movement and strikes if you train yourself to maintain these body mechanics while you are moving. You can see the difference by striking a heavy bag or pushing a partner (carefully) Try it once as you normally would and then try again with everything is the same except make sure this spiral is happening through your entire body the whole time. Train to have spring power going on the entire time you’re moving. This way if someone pushes or strikes you they are pushing or striking that spring. If someone pushes or strikes you and your muscle is just regular hanging meat, the force penetrates and it goes in at the point of impact. But if there’s a spiral acting on that, the force wants to become part of that spiral and dissipate. and so that’s where you will feel this springiness in someones body who has done this training and impact tends to dissipate across the surface. Now can it be overridden? but of course. for anything you can discover there’s always a counter of something stronger and more and bigger and faster and all that stuff. So I’ve given you some of the key basics of how to make this work and how to begin building the Iron Body and Internal Power of Wing Chun. There is a lot more that can be done with this. There are other postures, other body mechanics, other methods (here we talked mostly about spring) and other internal aspects that you can put into this to make it really internal and we’ve got more videos on those. 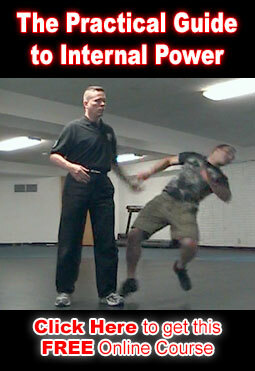 This lesson has been about using the basic posture of Wing Chun to build Iron Body and Internal power. However you will also fight with this posture as well. 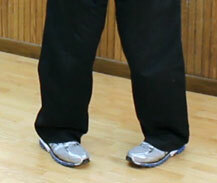 For now keep in mind that this is a close range posture and that Wing Chun is primarily a close range system. Keep these body mechanics happening as much as possible throughout all the training in this series. 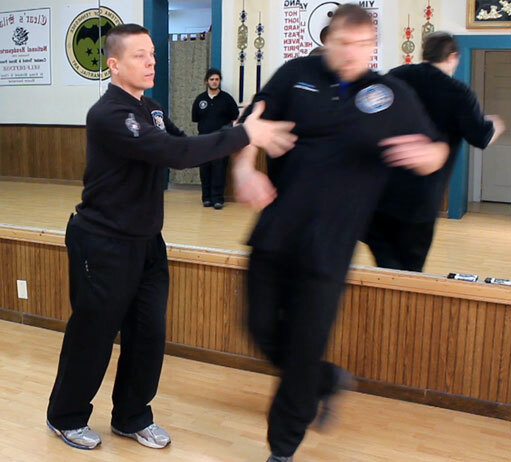 As we dig into the core fighting method of Wing Chun you’ll learn more and more about how to fight effectively from this position using these principles.